Only the very brave or the very stupid venture into the Black Mountains. It’s an accursed place, inhabited by monsters, cutthroats, and the enigmatic warlock, Zogar. If it weren’t for the rumors of vast treasure troves and arcane knowledge, none would venture to this bleak land. Many leave seeking glory, power, and riches, but few are ever seen again. Those who do return have a haunted look about them and they speak little of the horrors they have seen. Despite everyone’s advice, you now set off to meet Zogar’s challenges. For fame and glory! 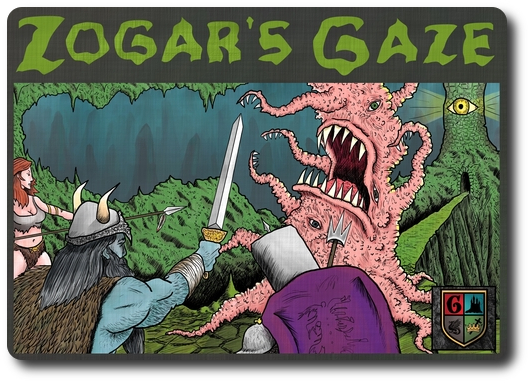 Zogar’s Gaze, designed by Jason Glover and published by Grey Gnome Games, is comprised of 68 “Level 1” Dungeon cards, 43 “Level 2” Dungeon cards, 30 “Level 3” Dungeon cards, 21 Market cards, 6 Race cards, 6 Class cards, 5 standard six-sided dice, and 1 Reference card. The cards are durable and as thick as your standard playing card. The illustrations by Jason Glover have a retro look about them that make me recall fond days of looking through old Dungeons & Dragons monster manuals. Excellent stuff. To set up the game, first separate the cards by type. There should be a pile for Dungeon, Race, Class, and Market cards. Second, shuffle the Dungeon cards (all 3 levels together) and place them face-down in the middle of the playing area. This is the Dungeon draw deck for the duration of the game. Third, shuffle the Market cards and place them face-down above the Dungeon deck. Draw the first 2 Market cards and place them in a row next to the Market deck, face-up. This is the Market draw deck and market offering area for the duration of the game. 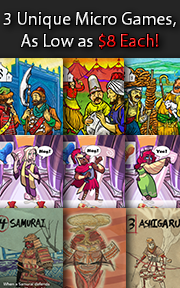 Fourth, shuffle the Race and Class cards separately and deal out 1 card of each type to each player, face-down. Players should keep their Race and Class cards secret. 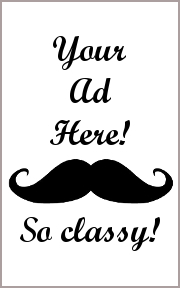 Return any undealt Race and Class cards to the game box without revealing them to the players. 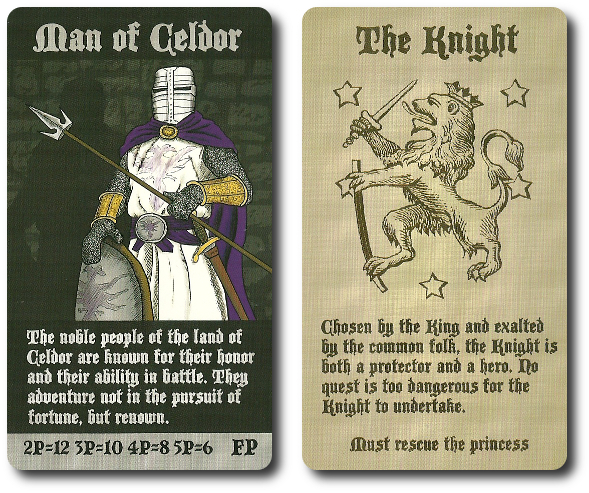 The Race and Class cards inform the player what they must obtain to win the game. This completes game set up. Pass the dice and Dungeon deck to the first player to begin your adventure! Zogar’s Gaze is played in turns with no set number of turns per game. On a player’s turn, they will complete the following steps. At the start of the player’s turn, they have an opportunity to visit the Market. Players purchase from the Market by discarding Dungeon cards. Each item in the Market costs 5 gold. Each Dungeon card is worth a number of gold coins equal to its level value. For example, a “Level 3” Dungeon cards is worth 3 gold. Players discard, face-down, as many Dungeon cards are necessary to equal 5 or more gold. The player then either takes one of the two face-up Market cards or draws the top-most Market card from the Market deck. The Market card goes in the player’s hand and the discarded Dungeon cards are shuffled into the Dungeon deck. Draw a new Market card if a face-up card is selected. The player now selects which items and equipment they want to take into the dungeon from their hand. Any items the player takes are placed in front of them, face-up. If the player perishes in the dungeon, any items and equipment they take with them will be lost. Any card in the player’s hand is safe. Players are welcome to take nothing into the dungeon if they like. The dark dungeons that belong to Zogar are home to many who are less than hospitable to adventurers. Not all are horrors, however. There are many unnatural creatures, but there are also even men and woman who use the dungeons as a base of operation. Players will have to defeat these enemies to continue their quest. When a monster is encountered, combat will ensue. Some enemies have a weakness towards a particular element or power. These are indicated with a letter (“F” for fire, “P” for poison, “I” for ice, and “H” for holy). If the player has the equipment with the listed element or power with them in the dungeon, they automatically kill the monster. If the player doesn’t have such equipment, they must take their chances using the dice. Players will roll all the dice and can roll the dice up to 3 times, holding as many or as few dice as they like each time they roll. The goal is to roll a number of dice and values shown on the monster Dungeon card. Green dice indicate that the player can defeat the monster if they roll the exact number of dice with the values shown OR they can roll any other value, but must have one more dice of that value included. For example, if the monster had 3 green “5’s”, it could be defeated with 4 “2’s”. Red dice indicate that the player MUST roll the exact number of dice with the values shown to defeat the monster. If the player successfully rolls to defeat the monster, they collect the Dungeon card and put it in their hand. They also earn a number of Fame Points (FP) equal to the number noted on the yellow box. For some Races and Classes, this is important. The player’s turn is also over and the cards and dice are passed to the next player. If the player fails to roll the correct dice, the monster Dungeon card and all items, equipment, and treasure brought into and found on the player’s turn is returned to the Dungeon deck. Market cards are returned to the Market deck. Given the above, let’s look at the “Red Dragon” Dungeon card. 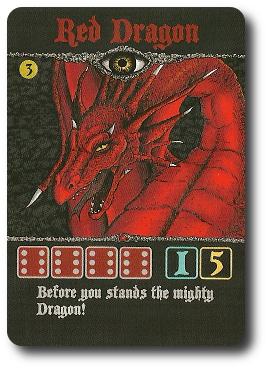 The card lists the monster’s name, what needs to be rolled to defeat it (in this case, the dice are red, which means the player MUST roll at least 4 “6’s”), and that the dragon can automatically be defeated if the player has a piece of equipment that uses the element of ice. If the monster is defeated, it’s worth 5 Fame Points and the Dungeon card is worth “3 gold” in the Market (the level of the dungeon determine’s the Dungeon card’s worth in the Market). Dungeons are dangerous places. If something isn’t looking to eat or stab you, something is very close to falling on you…or you falling into it. Traps will end a player’s turn if they are not avoided and can sometimes even be fatal. As long as the player’s character doesn’t die, they get to keep all their belongings. If, however, the player’s character does expire in the dungeon, all equipment and treasure brought into and found on the player’s turn is returned to the Dungeon deck. 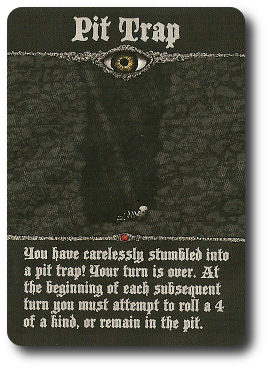 For example, the “Pit Trap” Dungeon card (which is hated by many players, by the way), doesn’t kill the player’s character. Instead, it makes them lose turns. It’s not lethal, but it can be a mood killer. As the player explores the dungeon, they will find treasure and useful equipment. Treasure can be used later to purchase Market cards. If the player finds equipment, it can be used immediately. It can also be lost if the player doesn’t leave the dungeon with it in their possession. 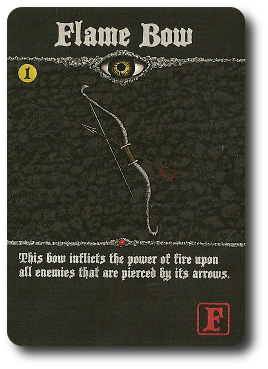 For example, the “Flame Bow” Dungeon card will inflict fire damage, killing some enemies without the player even needing to roll the dice. Or, if the player prefers, they can use the Flame Bow to purchase other items in the Market. In this case, the Flame Bow is worth “1 gold”. Note that some items are lost once used. Most weapons stay with the player and can be used as many times as the player likes until they are lost in the dungeon or they get tired of them and sell them to the Market. “Arthur’s Mantle” Dungeon card is removed from the game when it’s used and the “Helm of Darkness” is returned to the deck after it’s used. Other dangers and items can be found in the dungeon other than gold, items, equipment, and things that want to eat you. Random events occur in the dungeon and there are “Quest” Dungeon cards to be found. This also includes the dreaded “Zogar’s Gaze” Dungeon cards. The player is only required to draw 1 Dungeon card on their turn. If they like, they can continue to draw until they either get eviscerated (or meet their end in some other gruesome fashion), successfully defeat a monster, or lose their nerve and leave the dungeon. Once the player cuts the deck, they are committed to exploring at least 1 card further. Players should consider what it is they want to do, what they have gained so far, and what they stand to lose before they cut the deck and tempt fate. The player’s turn is now over (be it from death, a successful monster slaying, or chickening out). The removed top portion of the cut Dungeon deck is shuffled with the bottom portion of the Dungeon deck. Any cards lost are also included in the shuffle. The next player now goes. The game can end two possible ways. The first player to successfully complete the requirements set by their Race AND Class cards wins the game. A player can win the game out of turn. For example, the “Lurker” Race card requirement states that 6 “Zogar’s Gaze” Dungeon cards need to be revealed. Once the 6th “Zogar’s Gaze” Dungeon card is revealed by any player, the player with the “Lurker” Race card wins if they have successfully met their Class card requirements. 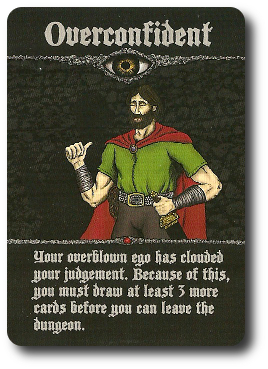 If 7 “Zogar’s Gaze” Dungeon cards are drawn, none of the players win. They have drawn the attention of Zogar himself and now face his wrath. It’s not directly stated in the game rules, but Zogar’s Gaze is meant to be customized. If players use all the cards in the game, the odds of them meeting their Race and Class victory requirements are slim. Not impossible, mind you, but victory won’t come easy or quickly. Think of Zogar’s Gaze directly out of the box as the most random and difficult dungeon you could ever explore. That is pretty interesting and a unique challenge, but if you want to tailor your dungeon delving experience into something different, Zogar’s Gaze can easily accommodate. Just remove the cards you don’t want to be bothered with. It’s that simple. The Zogar’s Gazette (Volume 2) provides one possible customized dungeon by listing the cards that are removed. I have duplicated the list here. The rules state that a player’s turn ends after they engage in combat. This game variant says phooey on that and allows the player to keep drawing Dungeon cards…if they want to. This game variant puts “Quest” Dungeon cards (cards necessary to win the game) on the auction block. Whenever a player draws a “Quest” Dungeon card, it’s placed, face-up, next to the Market. 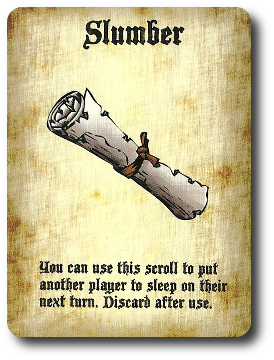 Even if the player needs the drawn “Quest” Dungeon card, it’s still sent to the Market. “Quest” Dungeon cards cost 8 gold to purchase. When a “Quest” Dungeon card is found by any player, it’s placed face-up next to the Market deck and now belongs to all the players. 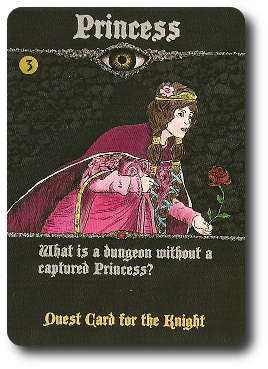 If a player needs that particular “Quest” Dungeon card to win, they should not say anything and continue playing until they have met both their Race and Class requirements. The “Lurker” Race card requires 6 “Zogar’s Gaze” Dungeon cards to be revealed in order to win the game. 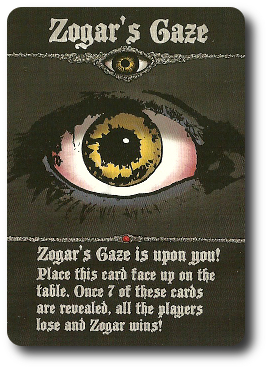 For every “Zogar’s Gaze” Dungeon card that is removed during game set up, reduce the number of “Zogar’s Gaze” Dungeon cards that are required for the Lurker. Or, just reduce the number regardless if any “Zogar’s Gaze” Dungeon cards are removed or not. This game variant puts “Glow Rock” and “Pandora Box” cards back into their respective decks once used. After several plays, we found that the Market wasn’t being used. We fixed this by simply revealing more Market cards. The rules state that 2 should be drawn and placed face-up. We drew 5 and found that the Market was much more worthwhile. The “Pit Trap” Dungeon card is a real pain. In theory, a player could spend the entire game stuck in the pit since they cannot roll the correct number of dice. We fixed this by making the pit a temporary inconvenience. If the player cannot roll the correct dice on their turn to get out of the trap, they spend their next turn climbing out of it. This way, the player only loses 2 turns instead of their patience. To learn more about Zogar’s Gaze, visit the game’s web page. I’m a bit concerned about the size of the deck, to be honest. Each Race and Class card lists something specific that must be found or earned in order for the player to win. The “Hero” Class card, for example, must find the “Excalibur” Dungeon card. That’s 1 card in 140. The odds of finding it in a random draw within a deck that is constantly being shuffled is not great. I predict long games. I also predict that all our groups are going to be fairly lukewarm about Zogar’s Gaze. I imagine the initial energy level and excitement will be high (especially with the Child Geeks), but both will dwindle if the game goes on too long or feels too random. Teaching Zogar’s Gaze is really simple. After you deal out the Race and Class cards, just start playing. When the first card is revealed, just tell the player what choices they have. When it comes to combat, just inform them what the difference is between red and green dice. Note that Zogar’s Gaze does require its players to read, but this is only necessary when determining if a Market cards is worthwhile or deciding on what piece of equipment to bring in the dungeon. Younger players can play this game, but will need some help understanding what certain cards do. Either team up or help out younger players when needed. You can also use some of the game variants to reduce the need to read certain cards. And so, after teaching the game to my two oldest little geeks, I asked them their thoughts on Zogar’s Gaze so far. My little adventurers are ready to go. Let’s enter the dungeon and see if we find adventure or boredom. The Child Geeks were very excited about this game. They looked through all the cards, talked about the monsters, wondered how powerful the weapons were, and discussed in great detail the pros and cons of the different races and classes. After playing the game, their level of enthusiasm dwindled. Our first game used all the cards (again, there is nothing in the rules that suggests you should customize the decks) and this created a great deal of frustration. Games were too long, it was difficult to find quest items, and players were constantly getting stuck in the Pit Trap. A few of our younger Child Geeks even left the game, forfeiting their turns. After I learned about the deck customization, I asked the players back. This time around, the games were faster and the Child Geeks had more fun. According to one Child Geek, “This game is a lot better now!” Another Child Geek said, “I like the game better, but I’m still not having fun.” When all the votes were tallied, the Child Geeks were mixed. Some liked the randomness and surprise of exploration and others found it frustrating that they couldn’t just go into the dungeon, rescue the princess, and call it a day. My little geek expresses his frustration and disbelief that he is STILL in the Pit Trap. The Parent Geeks were also unimpressed with our first couple of games of Zogar’s Gaze. They found it to be too long, too random, and too frustrating. According to one Parent Geek, “This game is way too repetitive. I don’t feel like I’m an adventurer. I feel like I’m working on an assembly line.” Again, I invited the players back after I customized the deck, and again, the feelings towards the game shifted. According to one Parent Geek, “Much, much better. 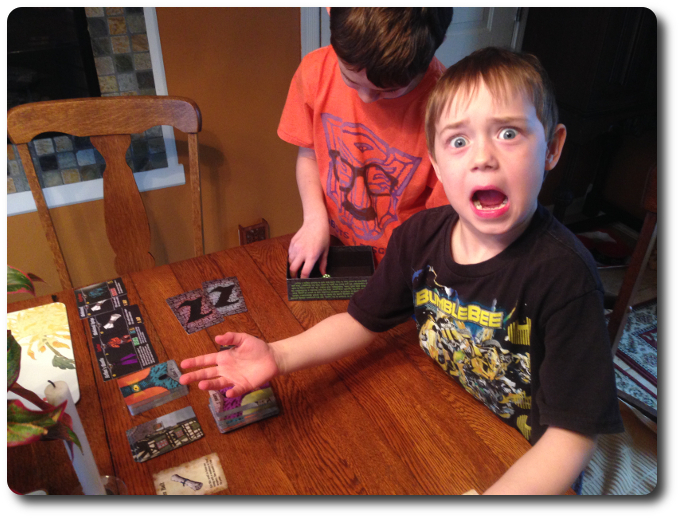 I’m surprised the game doesn’t come with a warning that says DO NOT PLAY THIS GAME WITH THE WHOLE DECK.” Despite the games now being faster and more enjoyable, the Parent Geeks gave Zogar’s Gaze mixed approval. Some enjoyed it enough after the deck customization to keep playing it, while others sought out other adventure games. The Gamer Geek’s experience mirrored both the Child and Parent Geeks. When we first played the game, the Gamer Geeks were exceedingly disappointed with it. According to one Gamer Geek, “Not good, not good at all. This game is just about grabbing cards and regretting the fact you are playing the game. I’d rather be playing Munchkin.” Which is saying a lot considering how much this particular Gamer Geek dislikes Munchkin (seriously, it’s a bit scary how much he loathes Munchkin). Other Gamer Geeks didn’t think the game was bad, but they did think it had too many cards. When we revisited the game with a customized deck, the Gamer Geeks found Zogar’s Gaze to be greatly improved, but not necessarily worth their time. According to one Gamer Geek, “Better, much better, but not anymore fun.” Another Gamer Geek said, “I’d play this again with the deck customization. It’s not a game with a great deal of depth, but I like the theme.” And still another Gamer Geek said, “The game itself is OK, but I really dislike the combat. Defeating a dragon is no more difficult than defeating another monster. You have the same odds for every monster you encounter. I don’t feel like I’m ever in a real state of growing danger.” When all the votes were counted, the Gamer Geeks decided to reject Zogar’s Gaze. Zogar’s Gaze, if played with all the cards, is not a game I would want to play again. It takes too long, is way too random, and you will spend multiple turns just going through the motions. In short, it’s boring right out of the box. Boring and difficult. All it takes is just a little bit of time to customize the Dungeon deck (and if you really want to, the Market deck) to create a much more interesting, entertaining, and worthwhile gaming experience. I must admit, that I was surprised that Mr. Jason Glover released this game when I first played it. All of his other games seemed much tighter and better designed. Zogar’s Gaze felt like a “bunch of cards in a box with some loose rules”. After I learned that the game was always meant to be customized, everything about Zogar’s Gaze made sense. Now, admittedly, I’m a bit of a fan boy when it comes to Mr. Jason Glover’s games. I think he’s a very talented game designer and I’ve enjoyed Of Dungeons Deep!, Plague, Dig Down Dwarf, and Four Tribes. I also enjoy Zogar’s Gaze. I’ll be the first to suggest it isn’t one of Mr. Jason Glover’s better creations, but I don’t find it to be a bad game whatsoever. Let’s call a spade a spade here and recognize that Zogar’s Gaze is a press your luck experience with enough cards to always guarantee a different game each time you play it. It’s a shame the rules do not suggest that the game should be customized, as I think many will play the game with all the cards and be left rather disgruntled. All it takes is a bit of customization to make the game an enjoyable experience. Some might see that as a “fix”, which I do recognize, but I see it as more of an opportunity to tailor the game to your players’ specifications. Want a difficult game? Keep the game as it is. Want a lighter and faster game? Remove traps and the most difficult of monsters. This allows you to make the game accessible to everyone, which is a pretty good deal and worth exploring. If you are in the mood for a randomized dungeon exploration game, where pushing your luck could lead to great rewards or certain doom, and customization is possible to tailor your gaming experience, do take a look at Zogar’s Gaze. Tagged Adventure Games, Card Games, Dice Games, Fantasy Games, Solitaire Games. Bookmark the permalink.